I’ve always been on the fence when it comes to cowboy boots. The line between keeping this western inspired boot chic and playful á la Kate Moss and going full on Dolly Parton is a fine one, that is too easily crossed. 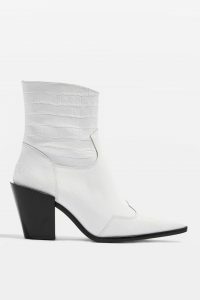 But it’s official: the cowboy boot has left the ranch, and got a high fashion update, the classic boot is now all over the high street in fresh, contemporary white. The cowboy boot is now common place in the front row of runway shows rather than the front row of Garth Brooks concerts, and it’s set to be the biggest trend of Spring 2019. Isabel Marant, Calvin Klein, Chloé, Fendi, and Off-white are just a few of the brands who featured this western staple on their runways, offering a range of reimagined versions with everything from knee high cowboy boots to all over patterned ones. Trickling down to the high street, white cowboy boots can now be found within the student budget from Zara and Topshop. This spring it’s all about the updated classic, so style this traditional boot in a way that radiates modernity, without losing its country charm. When styling the white cowboy boot keep the look contemporary and avoid looking like you’ve just stepped out of The Good, the Bad and the Ugly by making the only western inspired aspect of the look the boots. Steer clear of fringed jackets, boot cut jeans, chaps, cowboy hats and gun holsters to avoid looking less high fashion and more cowboy themed fancy-dress party. 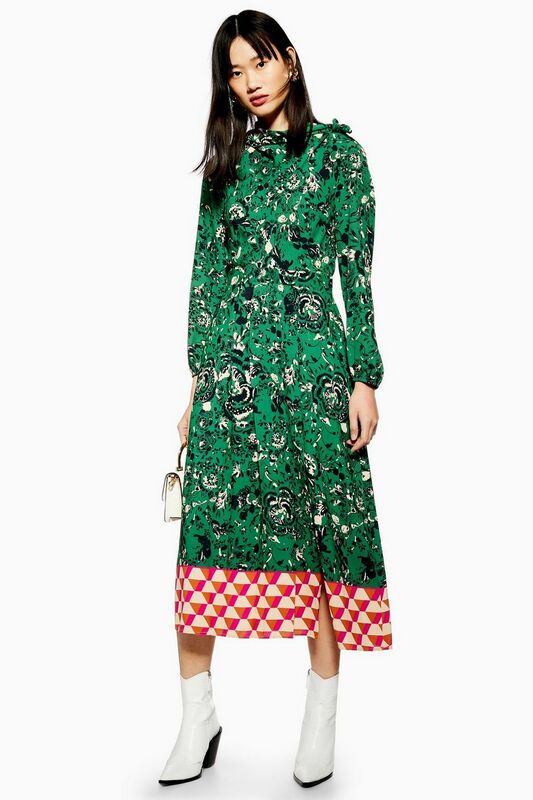 Instead of risking looking too cowboy and a little kitsch with a blue jean, opt for something a little softer, perhaps an a-line midi skirt or a silky slip dress. White cowboy boots are the perfect finishing touch to add some edge to an otherwise soft and feminine outfit. Use the boot to add something fresh to everyone’s favourite slip skirt and chunky knit combo or add a tailored duster coat and a micro bag for the perfect dressy spring sartorial statement. There’s nothing to say you can’t pair animal print with your cowboy boots (Shania Twain fans rejoice!). Kill two trends with one stone and match your white cowboy boots with a leopard print or snake skin blouse. For the more daring fashionistas pair your boots with a pair of snake skin mom straight leg jeans. Keep the rest of the look low key so as not to distract from these statement pieces. Let’s face it, you probably live in your black docs a little too much. Well, the longstanding reign of the classic black ankle boot has come to an end and has been overthrown by the cowboy boot. The cowboy boot can be just as versatile and can look just as edgy when paired with the right pieces. Instead of opting for the ankle length boot why not try the knee-high white cowboy boot, paired with a blazer dress and chunky jewellery, you’ll be sure to turn heads for all the right reasons, Yee-haw!